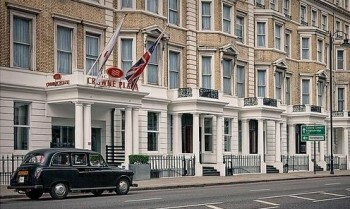 This is my review of the Crowne Plaza London Kensington hotel. If you have ever driven from Central London to Heathrow, you will have passed the Crowne Plaza London Kensington on Cromwell Road, somewhat dwarfed by the 1960’s monstrosity that is the Holiday Inn Kensington Forum across the road. Converted from a row of Georgian townhouses, it looks very unprepossessing. I have occasionally wondered what sort of hotel could be there to warrant Crowne Plaza branding. 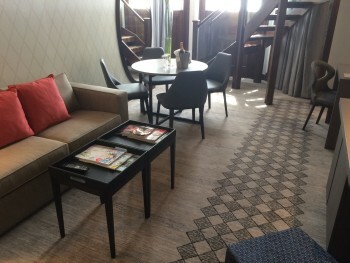 On Tuesday I got to find out, as I was invited to review the hotel at a press event to celebrate the relaunch following a top to bottom redecoration. It is very pleasant indeed, as it turns out. The rooms – very smartly redecorated, including full length mirrors which will satisfy every female guest – were also a surprise. 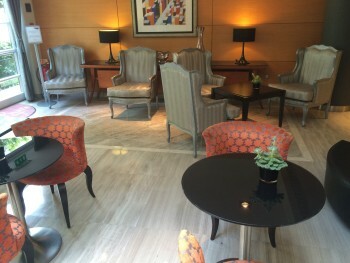 Of the 162 rooms, 70 are ‘double doubles’. The highlights, for me, were the duplex suites. These were apparently built because of a requirement to match the new interior with the listed exterior. 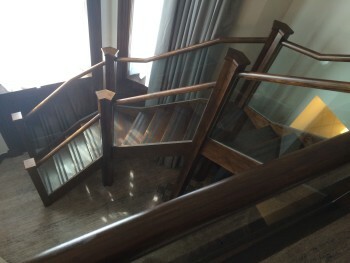 The result is a series of two-bathroom suites with a bedroom upstairs and a set of stairs leading to …. There is also a gym, which I didn’t see, and a number of meeting rooms. The restaurant on the ground floor, which has also had a very modern makeover, is called Umami and is Asian themed. One benefit of press tours is that you learn a few facts which the average guest would never pick up. A series of black and white art photographs around the hotel – very professionally done – turn out to have been taken by a staff member and feature other hotel employees! Tony the concierge, who took me around, has been with the hotel through its various incarnations since 1991. 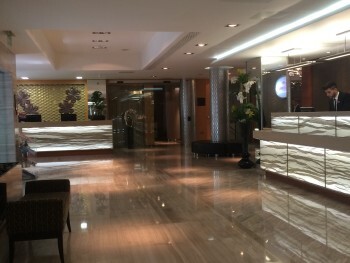 Apparently the Crowne Plaza London Kensington ran at 91% occupancy last year, even before the refurbishment. The average guest rating on the IHG website (4.5) is higher than Crowne Plaza The City and equal to InterContinental Park Lane. 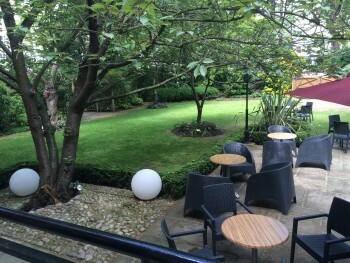 It is smaller than most of the major London business hotels and, being in Kensington, is walkable to the museums at South Kensington. Kings Road and Harrods are a short taxi ride away or two stops on the tube (Gloucester Road is the nearest station). If you are looking to redeem IHG Rewards Club points instead of paying cash, Crowne Plaza London Kensington is 45,000 points per night. 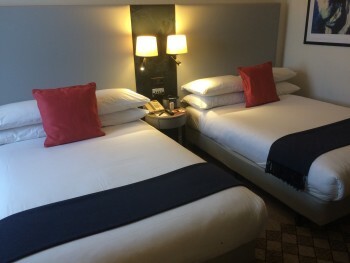 Considering that you are looking at 35,000 points for most Holiday Inn and Holiday Inn Express hotels in London – including the ‘in dire need of refurbishment’ Kensington Forum opposite – it is a decent deal. This also used to be a holiday inn about ten years ago. I stayed in a duplex suite there quite a few times and it was a relatively unknown bargain for central london. It used to have parking available too – albeit across the street underground. I booked a room in the sale a year ago and was upgraded to the duplex suite. 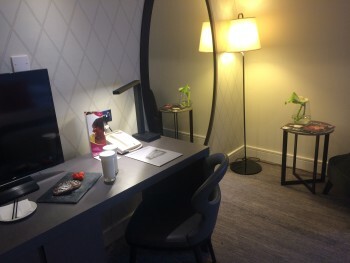 Very nice – you forgot to mention the terrace… I also booked a redemption room around the same time and was given an upgrade with lounge access. If you do have lounge access, you also have the choice of eating breakfast in the restaurant, but this wasn’s special, interestingly enough. Thanks. This looks very interesting. As you say, I have passed this hotel many times but never had much of an idea of the inside. I will bear it in mind on the next occasion I need to have quick access to LHR. Hadn’t realised it had a refurb – as my only visit was 12 days ago to have dinner in the pan-Asian restaurant there. 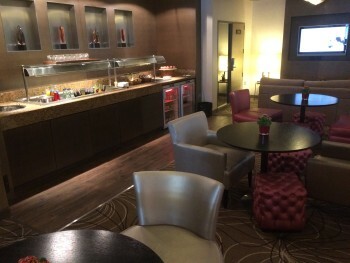 Good food, nice lobby bar for drinks.